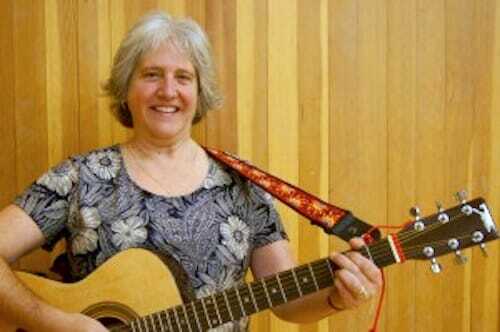 Lori Adessa has been teaching music in Mill Valley since 1993. Adessa began her musical career at age 10, specializing in 5-string bluegrass banjo. She has a BS in Music Therapy from Indiana University, where she majored in classical guitar. She spent the first half of her post-college career as a music therapist with a geriatric population in nursing homes, retirement homes, and adult day care facilities. She conducted a Senior Rhythm Band of 20 residents that performed once a month for various senior centers and elementary schools in and around Georgetown, Texas. Before receiving her music credential from California, Adessa received a teaching credential in Georgia, where she taught K-5 general music for two years. Adessa currently teaches music classes at Park (K-3), Tam Valley (K-2) and Old Mill (K-2). She lives in San Francisco with her husband, daughter (a Tam Valley student), and her father, and loves bowling, swimming, hiking , traveling, cooking, baking and eating anything French. Adessa's new passion is learning to play flamenco guitar so that she can accompany her daughter dancing Flamenco. Adessa is always on the lookout for teachers or parents who share her love of bluegrass music…contact her if you’d like to jam or know someone who does! Kindergarten Music with Lori Adessa from Kiddo! Mill Valley on Vimeo.